I saw this spoon art on Pinterest and decided it would be super fun to do for my kitchen, using paint colors from my color scheme, of course. I already had acrylic paint in the right colors, left over from this wall art project, so I just needed a canvas and a million spoons. I went to Goodwill first. I was thinking about doing just 3 large serving spoons centered on the canvas, instead of tons of small spoons. But I couldn’t find any cool old spoons at Goodwill, so I ended up getting a couple boxes of tiny appetizer spoons from the Grocery store. They’re actually plastic, but very metal looking. Plastic was a good idea in the end; I think metal spoons would have been too heavy to hang on the wall. First I set all the spoons on the canvas to determine exactly how many I needed. 56. Ugh. Then I poured paint on the tip of each spoon and rolled it around to look like they’d been dipped in paint (the spoons were just ever so slightly too large to fit into the bottles of acrylic paint, of course). I left them on paper to dry overnight. Then I hot glued each individual spoon to the canvas. This took forever, but it was worth it in the end. I submit to you, the most annoying project ever. Okay, maybe not quite as annoying as my earring hanger/organizer project. But a close second. Annoying enough to drive me to eat chocolate chip cookie dough ice cream out of the carton. Hey, it’s a small carton! 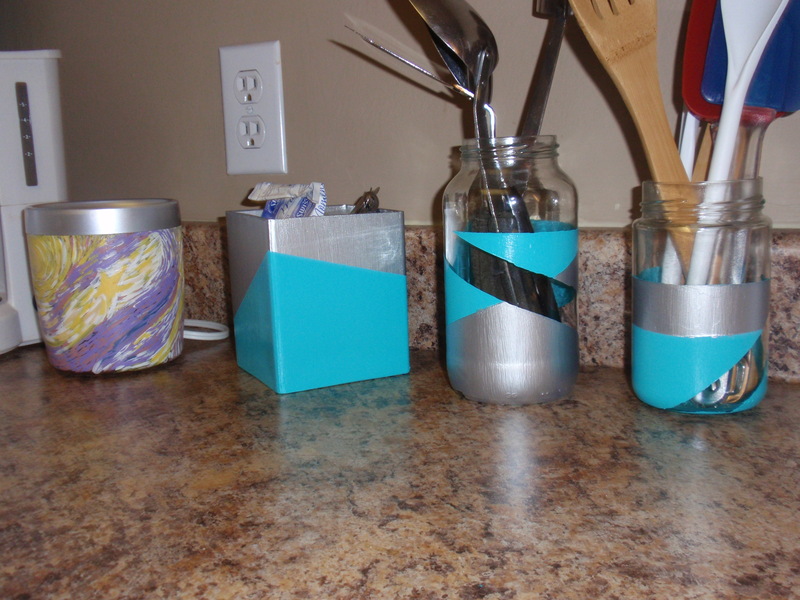 I was rinsing out a salsa jar when I had the brilliant (at the time) idea to dip-dye paint a few jars and make matching utensil holders. This was supposed to be a quick little project that I’d work on in between coats of paint on the end table. But nooooo. I’m blaming all my problems on the humidity. Every time I peeled the painters tape off, the paint came with. Or it just left weird, bubbly warped edges. So my quick little project turned into constant attempts to repaint/fill in bare spots. I have no idea if the humidity really is to blame, but I do know that paint takes longer to cure in humid environments (hence why the end table is getting two nights in between coats of white now). Honestly, I’m not loving them as much as I love the square guy. I have a few more pasta sauce and salsa jars, so there may be an update in the future. I also kind of feel compelled to throw my “van gogh-esque” container in the middle to mix it up visually a bit. 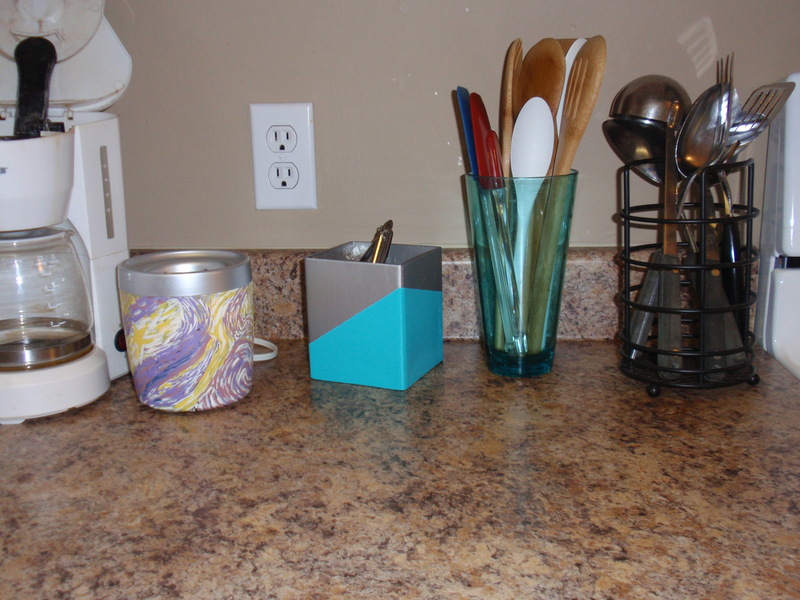 That container was a pre-blog project, painted with acrylic paint and actually sprayed with acrylic sealer. Has anyone else had problems with humidity and painters tape? Maybe painters tape is not meant for acrylic paint?